This ancient deciduous tree has large crown composed of sparse branches covered with interesting lobed, fan-shaped leaves that are unlike those of any other tree. 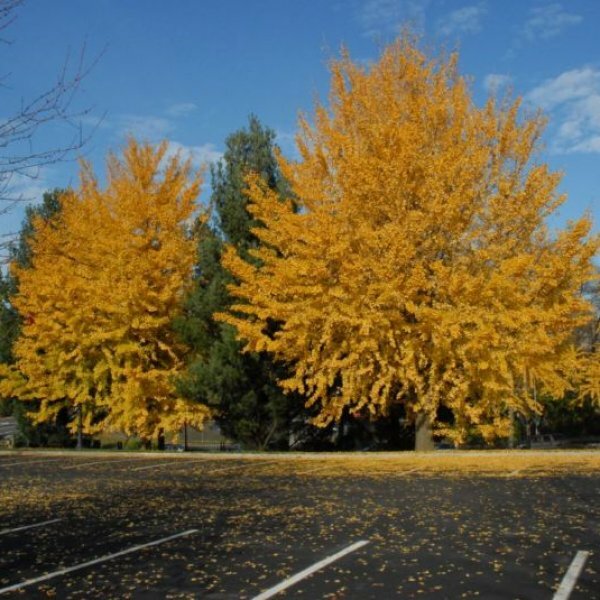 They turn captivating shades of gold in fall and drop quickly, creating a bright carpet that slowly fades to brown. In the winter, its stark, deeply furrowed, grayish tan bark and knobby branches add additional landscape interest. 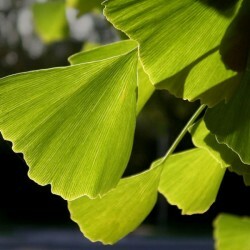 Ginkgo is a tall, hardy tree native to eastern China. The story of this living fossil is a fascinating one. 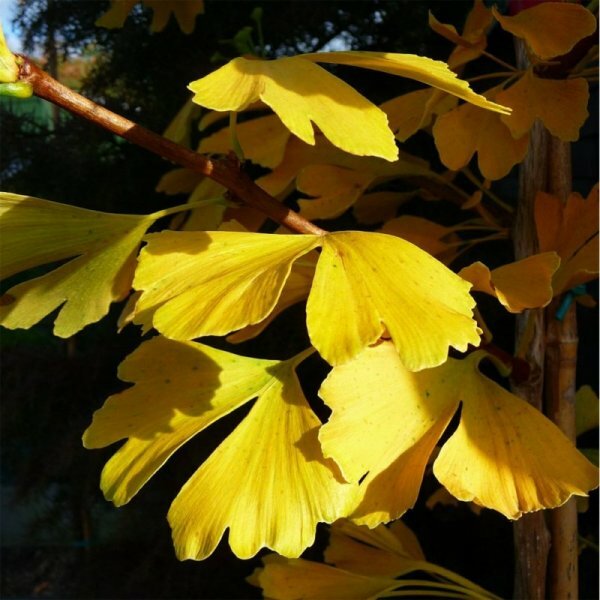 It is the last surviving species in Ginkgoaceae, a plant family that has existed for 150 million years, according to the fossil record. For thousands of years, Chinese and Japanese monks cultivated ginkgo as sacred trees for food and medicine, but populations were believed to be extinct in the wild for hundreds of years. In the mid-twentieth century, wild populations were reportedly discovered on Tianmu Mountain in the Zhejiang Province, among other remote forest regions. 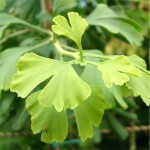 These claims are still under scrutiny because many botanists believe the “wild trees” have actually escaped from cultivation. The distinctive fan-shaped leaves of the ginkgo are borne in small clusters of three to five on short, knobby spurs along the branches. The leaf blades are bright blue-green or yellow-green and have minute, parallel veins and a central dividing lobe, hence the botanical species name, biloba. In autumn, they change to vibrant yellow and gold but will be shed quickly in a freeze. 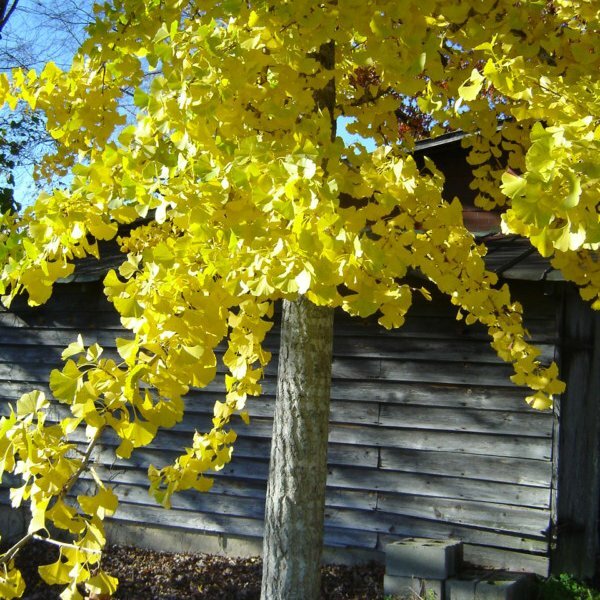 This tree is dioecious, which means that male and female flowers appear on separate plants. The fleshy, orange-tan or pale yellowish fruits produced by female trees have a very foul odor, despite the fact that the nuts within are edible and expensive to buy in Asian markets. 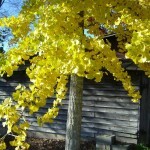 For this reason, many landscapers seek male cultivars. Germination The pretreatment not required, but we do recommend to stratify for 30 days to increase the germination rate. 1. Chip the seeds with a sharp knife very carefully (don‘t brake the coat or damage the inner seed) or make a few swipes with a sharp edged file or use sandpaper to allow moisture being more readily absorbed. 2. Soak the seeds in cold or lukewarm water for about 24 hours to soften the coat. 3. Put 3-5 seeds in 3 times the amount of moist sterile sand (1 part water + 4 parts of sand), moistened kitchen towels or slightly dampened vermiculite, or moist peat. 4. Put this in a little container or small sealed polythene bag in the fridge (+ 5C) for 30 days. If you use kitchen towels place the seeds on one half, cover with the other half, put in matching thin polythene bag and close it. Mold growing on the towel is no problem, just get a new towel. Check twice a week for fungus and germination and turn them over. 5. You can sprout them in the peat moss in a plastic, or glass container (keep the seeds sandwiched between layers of peat moss. The peat moss prevents fungus or mold from forming on the seeds). It takes about 4 weeks for the seeds to sprout. Some take longer. Remember these are seeds of tree, so they are not as fast to germinate as flower or vegetable seeds.